If you were to sum up what the modern fly caster is striving for, it can be done in two words: good-looking loops! Being a skilled fly caster has a certain status attached to it, and good-looking loops are the signature of the skilled fly caster. So what is a good-looking loop? In my opinion, it is a loop that is controlled 100 percent. It may appear in different shapes, but the hallmark is a cast controlled completely by the fly caster. In order to constantly deliver controlled loops, you must understand the basic physical principles of the fly cast. You’ll find that the fishing will be better and more interesting if you sit down and think the cast through in any given situation: how should the fly be placed in order to get the right movement over a possible holding area? Take salmon fishing with a fly skating the surface, called riffling hitch, as an example. Here you have a situation where it is of the utmost importance that the fly fishes from the moment it touches water and rides the surface throughout the drift. But if you use a standard-length leader, the current will grab the fly and drown it. The solution is to use a leader that is, theoretically, far too short. If you think the cast through, you’ll realize that the fly line, as a consequence of the short leader, will travel too fast, making the leader stretch too abruptly. The result will be either that the leader bounces back like a spring, which means that the fly will not fish before the current stretches the leader, or that the fly and leader hit the water with a splash, scaring the fish. To compensate, you must moderate and soften the cast before the fly touches the water. 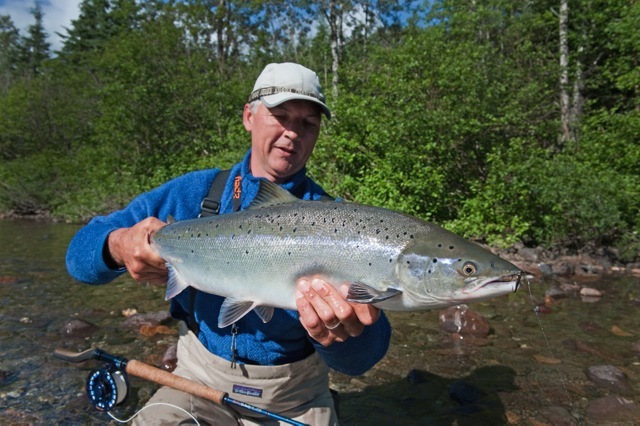 Henrik has worked professionally with fly tackle design and development for more than 18 years, and he has caught more than 3000 salmon on the fly throughout the world. Whether it's the design of world-class fly rods or developing some of the best fly lines, there is no-one more adept than Henrik. He is recognized as one of the world's finest casting and strategy instructors, educating thousands of fly fishers worldwide.